There are little dinosaurs in my backyard. 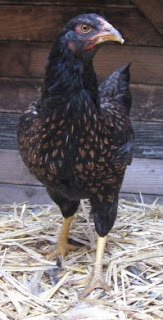 They weave when they run, necks stretched forward. They peer around corners with their heads turned slightly, watching you out of one eye. When a piece of food is presented, they pounce all at once and tear the morsel apart. Chickens are kind of scary. They're also kind of cute. I let them out of their coop today for the first time, and they proceeded to spend a good couple hours wandering around the yard pecking at things. They like grass. They like hollyhock leaves. They like fingers when they're offered. They especially like blackberries, but they can't reach them, a fact that (as you will see later) can be used against them. They move in a cluster, drifting apart only until one of them startles, or dashes for something, then they all follow suit, converging together in the same direction. They're never sure if they're running for their lives or trying to get a piece of something edible, but they approach both with equal seriousness. It was a lot of fun letting them out. It was less fun getting them back in. 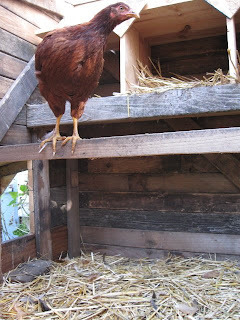 There's a step down when you open the front door of the coop, and none of them had any problem hopping out, but somehow as I tried to usher them back up the step, they just didn't get it. My housemate and I ended up having to catch each one. The last two were particularly difficult, having taken refuge in a corner of the yard where they could slip into the neighbor's yard if they wanted to. We had to lure them out with blackberries (suckers! ), cut off their route of escape, and then corner them. I am scratched and wing-battered. I held each one after I caught her, legs and wings contained, and cooed to her and stroked her before putting her back in the coop. Supposedly there is a secret ninja technique for catching chickens. It involves coming down at them directly from above. It is based on dragon-fighting techniques from times of yore, when dinosaurs and ninjas roamed the earth together. Hi-YA! I tried it and it did not work. Maybe it takes time to become a ninja. Maybe you need to learn secret techniques, and practice a lot. Maybe it doesn't just happen overnight like it did for Tom Cruise in The Last Samurai. I need a teacher in the ways. I must learn the Technique of the Luminous Five Blade Eagle Claw Descending! I need to find the master. Can someone point me to the right cave?